This is the first marketing post I’ve written – granted it is in the guise of an analytical review – but let’s be honest, I’m showing off results here. Every four weeks I report traffic growth numbers to my clients and I use those numbers to extrapolate an annualized growth rate. (I use a straight line forecasting – in simple math terms, if you averaged 5% growth during a quarter, your annualized growth rate is 4×5% = 20%.) 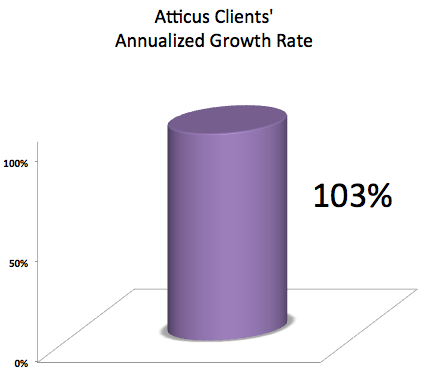 Depending on the client, Atticus’ job is to exceed a 25-33% growth over pre-engagement traffic. Through the end of September, Atticus clients are on track to more than double their traffic with a 103% annualized growth rate. Individual site performance ranged from -7% to 241%. Conrad that is so cool that you have more then doubled traffic. I use a lot of internal factors like traffic increase when I help clients. Have you thought about reporting number of lead leads generated? Fortunately I catch my clients before they get a website so I pick a SEO number with them and set up PPC number swapping. So I don’t get penalties and I can track even every call to the source. Of course some of the leads had a prior experience with the company but this helps me report what I actually got them this month fairly close. And just for fun my clients report back to me what they got in sales. So now I know their ROI in addition to their cost per lead. It’s empowered me to make some good decisions for them.